The MimioFrame touch board kit turns your conventional whiteboard into a touch board. Using your existing classroom whiteboard, projector, and computer. Create a touch board with ease using your conventional whiteboard. The MimioFrame allows the teacher and multiple students to work together with Touch 360° interactivity. Students write and manipulate objects above, below, or parallel to one another with a smooth and consistent response—making collaborative learning at the front of the classroom a reality. 10 touch points (5 dual-touch points). The frame installs directly onto your dry erase board using industrial strength tape— no drilling, no mess, and no losing of valuable whiteboard space. Includes the dynamic MimioStudio™ classroom software and MimioMobile™ app, which together enable collaboration and assessment at the front of the room or on almost any device. Comes with three free MimioMobile connections. The lightweight kit design allows for costs lower than a standard touch board. 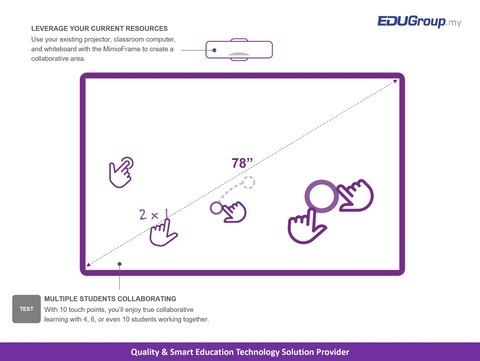 Use your existing projector, classroom computer, and whiteboard with the MimioFrame to create a collaborative area. 6. MimioStudio Classroom Software - Powerful collaboration and classroom assessment software that allows teacher to create interactive lesson in under 5 minutes. MimioStudio software–so easy to use and engaging, your teachers will use it every day. The MimioFrame touch board kit includes the dynamic MimioStudio classroom software. It connects the Boxlight products, so using other tools—from the document camera to the pen tablet—is quick and easy. 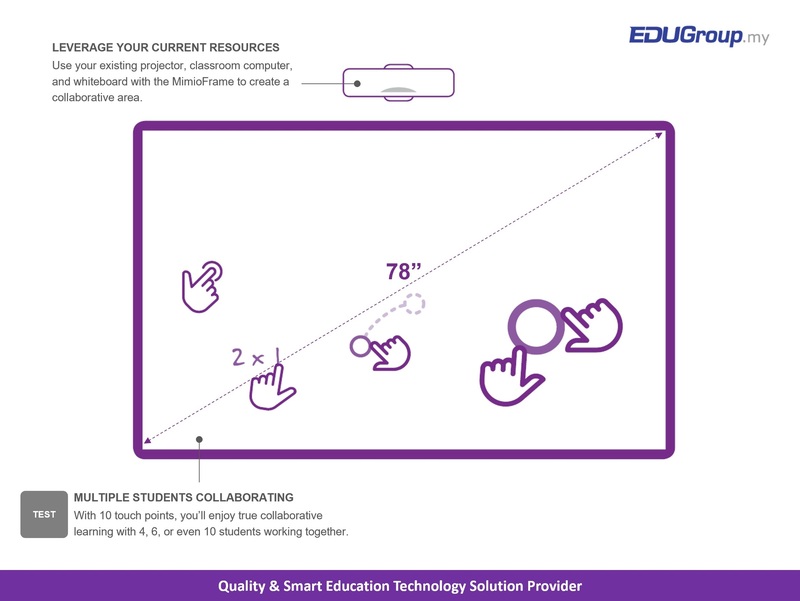 MimioStudio software allows educators to create interactive lessons and collaborative activities, as well as perform real-time formative assessment. The software also opens other IWB activities, enabling educators to use the interactive content they already have. Take learning a step further with our MimioMobile app, which brings group learning and collaboration to almost any device. With 19 years of experience in Education Industry, we are confident that MimioFrame is the ultimate answer to all educators, conforming the product quality, simple and accurate technology, extensive software and hardware support, with affordable pricing. We are Malaysia Distributor and looking for genuine dealers in town and city across every state. Contact +60 12-545 1300 for details. Thank you!